The most popular decoration is spun sugar – a delicate cobweb of caramel wrapped around the outside of the pyramid. As caramel absorbs water from the surrounding air the effect of the spun sugar will be different on each croquembouche. Fresh flowers look great around the base of the croquembouche – either just a few to compliment your colour scheme, or a thick band of flowers and greenery all around the base. 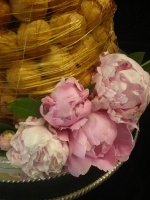 Chocolate or sugar roses can be used within the croquembouche for a great effect, replacing some of the choux balls. Sugared almonds give a pretty effect, either scattered amounsst the choux pieces or as more formal flower shapes, and these are the most traditional option.